This article is about the band. For other uses, see Empire of the Sun (disambiguation). The duo have won a number of Australian music awards, with Walking on a Dream receiving 11 nominations at the ARIA Music Awards of 2009, winning seven, including Album of the Year. Luke Steele and Nick Littlemore met in 2000 after being introduced by Steele's A&R executive, Simon Moor, in a bar in Sydney. Both were at the time signed to EMI and had already been working on different projects. Over the years that followed, the two collaborated on a number of occasions. Littlemore helped write the song "Tell the Girls That I'm Not Hangin' Out", which appeared on The Sleepy Jackson's 2003 debut album, Lovers, and Steele had some artistic input in Littlemore's 2006 art-rock project Teenager. After a falling out over the song on Lovers the co-operation ceased for a while, with Littlemore commenting "I’m a very intense person and I take things to heart". The two reconvened in 2006 to work on two songs for the Pnau album that was released in late 2007. They collaborated on the tracks "Freedom" and the opener "With You Forever" where Steele supplied the vocal. This prompted a change in direction for the band who began to craft a work more vocally-centered album featuring guest performances. A track-by-track analysis of the album Pnau revealed that writing of "With You Forever" with Luke Steele inspired Littlemore's band to begin work on a collaborative project. Littlemore said, "We fell in love with music again with [With You Forever]; I think this is [Pnau's] first great song." The release of Pnau brought an interest from Elton John, who signed Littlemore to his management company. The new project began to develop under the working title of "Steelemore" as a collaboration between Steele and Littlemore, with Pnau partner Peter Mayes listed as a producer and occasional co-writer. As Steele was living in Perth and Littlemore was in Sydney the two spent time writing songs separately while meeting occasionally in Sydney to decide on the musical direction and style. When they had accumulated enough material Mayes and duo began to record the album throughout 2007 with the assistance of Jonathan Sloan. While the record had been largely recorded and mixed throughout 2007, the self-titled Pnau album took precedence for Littlemore and Mayes in the first half of 2008. The duo put out the title-track "Walking on a Dream" in anticipation of the album's release. It appeared in digital format on 30 August 2008, and received airtime on Australian radio and reached number ten on the Australian ARIA Singles Chart. A second single, titled "We Are the People", was released on the 30 September and peaked at number twenty-four in Australia. The album Walking on a Dream appeared on 3 October 2008 and debuted at number eight on the ARIA Albums Charts, peaking at number six. The duo embarked on an international promotional tour in support of the album that was released in Europe in February/March 2009 followed by a North American release in April of the same year. While the project had initially been conceived as studio-only, the growing success brought "an audience [to which] we felt a duty to be good to them". Upon their return to Australia Steele began to prepare for a live debut of the band at Parklife Festival in September and October 2009. The headlined three shows, described as a visual "overload [where] giant graphics swam and spun over the stage as costumed dancers writhed to the beat and Steele on a pedestal onstage, [wearing] a gigantic metallic headpiece and his usual ‘Ming The Merciless' robe". A third single, "Standing on the Shore" was released in June 2009 however promotion was scaled back when Steele suffered from exhaustion. A remixed version "Without You" was released as the album's fourth single the following September. Littlemore decided to opt out of performing with the band live, citing 'I’ve always felt that once you make a record it’s not yours anymore'. Steele gave the impression that his partner left the band in September 2009, however, Littlemore resurfaced in the following month, citing his production work and a project with Cirque du Soleil as the reason for the lack of communication. He divided his time between the UK and Montreal while working on other creative commitments. Steele continued to perform live with the band at a number of Australian outdoor events. Towards the end of 2009, the band received a number of ARIA Awards for Walking on a Dream, including Best Album of the Year. The band performed as a co-headliner at the touring Future Music Festival around Australia in February/March 2010. The band made their international debut at the Vivo Latino Festival in Mexico City in April of that same year. They moved to Europe for the summer festival season where they performed at among others Glastonbury and Rock Werchter. The band made their American debut at the Lollapalooza festival. In October 2010, "We Are the People" was used as the soundtrack for a Vodafone TV commercial in Germany and subsequently topped the German Singles Chart. In November 2010, Littlemore indicated that he had "talked to Luke (Steele) the other day; we're doing a new record. We've already written a couple of tunes. You know when it's right I guess". In July 2011, Littlemore announced that the band had gone into the studio at the end of June to begin working on a second Empire of the Sun album while he confirmed would "come on board this time, actually come together and tour". As recording continued, Littlemore continued to have Pnau related commitments, releasing the album Soft Universe in 2011 and the Elton John remix album Good Morning to the Night in 2012. For much of 2012, the duo and their collaborators spent time recording material while Steele and the band retired from touring. On 11 March 2013, the band revealed a trailer for their second album entitled Ice on the Dune directed by J.D. Dillard and confirmed the release date as June 2013. The lead single "Alive" was released on 16 April and on the same day, the album was made available for pre-order on iTunes. The single had moderate success in Australia and Europe. On 18 April 2013, the Farrelly brothers announced that the band would score Dumb and Dumber To. Ice on the Dune was released on 14 June 2013 in Australia and New Zealand. Steele would later describe the lack of success of the album as part of their progression as a band. Steele received global media attention following an interview he completed with music publication NME in August 2013 at the Sziget Festival in Budapest. During the interview, Steele compared Ice on the Dune with Daft Punk's 2013 album release Random Access Memories, stating: "They had a great marketing campaign, but we’ve got better songs." In 2014 the band performed at the Coachella Festival, headlining the Sahara Tent. "Alive" was used in the introduction video for Google I/O 2013. It was also played within the introduction video of the new Yahoo! logo on 5 September 2013, played over the end credits of the 2013 film Paranoia, and featured in the movie Dumb and Dumber To. "Alive" was also a featured song on the soundtrack of EA Sports game, FIFA 14. In December 2014, Empire of the Sun released two songs, "Tonight" and "Wandering Star", which were written for the Farrelly brothers film, Dumb and Dumber To. For much of 2015, the duo were writing and recording of their third album in Hawaii and Los Angeles. By the end of the year, Steele noted that the new release was "75 percent there". The band continued to perform live in the second half of 2015, including a show at the Hollywood Bowl. In January 2016, the band's 2008 album title track "Walking on a Dream" was featured in a national commercial titled "The Dreamer" in the United States for the Japanese automaker Honda to promote the 2016 Honda Civic. The song finally led to the US chart breakthrough for the band, peaking at number 3 on Billboard's Alternative music charts, topping the dance music charts, and peaking at number 40 on the Mainstream Top 40 chart. In August 2016, it was announced that the third album Two Vines was set for release on 28 October 2016. The album was co-produced by Peter Mayes and features contributions by Lindsey Buckingham, Wendy Melvoin, and former David Bowie collaborators Henry Hey and Tim Lefebvre. The 15-track album includes a remix of the song "Walking on a Dream" and was partly recorded in Hawaii. Littlemore explained the inspiration behind the title as "this image of a modern city overtaken by jungle". The first single "High and Low" was released on 24 August. "High and Low" was also featured in the EA Sports game, FIFA 17. In an interview with Billboard in August 2017, Steele announced that he and Littlemore had recently started working on their fourth album in Japan, and that a music video for "Way to Go" was also shot in Japan. He spoke of how he loves Japanese music, and that a koto player came in for a day. In September 2017, DS Automobiles released a video featuring a new exclusive Empire song, "On Our Way Home", starring the Ukrainian model Alina Kovalenko. Although the name of the project has been attributed to the 1984 novel of the same name by J. G. Ballard, Littlemore denied this and offers an explanation, saying, "the name comes more from the idea of ... the fact that we're traveling around the world going to all the places of empires of the civilization where the sun has been a theme of worship. It's not based on the Ballard novel nor the Spielberg film of the same name." The band employs elaborate stage sets and headdress, which reflects the duo's background in visual art. Littlemore explained that "we did see Alejandro Jodorowsky's Holy Mountain and it influenced the way we could think about visualization". The band has worked with a number of designers, including Jessica Huerta. Steele described the inspiration for the visual aspect as "the vision of this band, it's built on imagination, so it comes from studying the samurais in art school to digital graphics, to topography, to filming under the ocean, to oil paintings, anything really." In the UK, they gained fourth position on the BBC News website's Sound of 2009 poll. 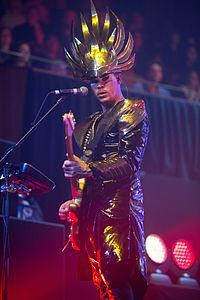 Empire of the Sun appeared for the first time in a Triple J Hottest 100 with two entries in the 2008 countdown: "We Are the People" at number sixty-eight and "Walking on a Dream" at number four. "Walking on a Dream" was nominated as "Song of the Year" at the 2009 Australian Performing Rights Association awards. Empire of the Sun were nominated for six awards at the 2009 ARIA Awards. They were nominated for Album of the Year, Single of the Year, Best Group, Best Pop Release, Best Selling Single and Best Selling Album, winning all but the Best Selling awards. Steele also performed "Walking on a Dream" at the event. Empire of the Sun also received an additional five nominations—Producer of the Year, Engineer of the Year, Best Video and Best Cover Art—as part of the Artisan Awards section of the 2009 ARIA Awards, and won all but two of these awards. 2009 Available on Nokia Music Australia as an exclusive bonus album track. Available as a free download for members of the official Empire of the Sun forum. "We Are the People"
Available on the deluxe 2-disc edition of Walking on a Dream, released on 20 November 2009. "Without You"
2008 Josh Logue Filmed in Shanghai, China. Filmed at Mina, Nuevo León, and Xilitla, San Luis Potosí in Mexico. 2009 Filmed at Lancelin, north of Perth, Australia. Filmed at FOX Studios, Sydney, Australia. 2010 Nash Edgerton Filmed in New York City, United States. 2013 Charles Scott and Alex Theurer Filmed at Bryce Canyon National Park, Utah, United States. Emmett Malloy Filmed in San Fernando Valley, California, United States. The ARIA Music Awards of 2009 nominations were announced on 8 October 2009. Empire of the Sun received the most nominations of any artist, with a total of eleven. The winners were announced on 26 November 2009 with Empire of the Sun winning in seven categories. The nominations for the ARIA Music Awards of 2010 were announced on 28 September 2010 and the winners were announced on 7 November 2010. The final nominees for the ARIA Music Awards of 2013 were announced on 14 October, as well as the nominees and winners for the Fine Arts Awards and Artisan Awards. ^ Two Vines did not enter the NZ Top 40 Albums Chart, but peaked at number two on the NZ Heatseekers Albums Chart. ^ "Two Vines" did not enter the NZ Top 40 Singles Chart, but peaked at number eight on the NZ Heatseekers Singles Chart. ^ Calligeros, Melissa (28 February 2010). "Between the raindrops, the festival raged on". The Sydney Morning Herald. ^ Wete, Brad; Ramirez, Erika; Lipshutz, Jason; Hampp, Andrew (1 September 2013). "Beyonce, Phoenix, 2 Chainz and More Kick Off Made In America Festival 2013". Billboard. Retrieved 23 October 2016. ^ Babayan, Siran (13 August 2010). "Live Review: Empire of the Sun at the Music Box". LA Weekly. Retrieved 23 October 2016. ^ Kaufman, Gil (19 August 2009). "Jay-Z Unveils Blueprint 3 Track Listing". MTV News. Retrieved 23 October 2016. ^ a b c d Burr, Mike (8 April 2009). "Empire Of The Sun: Interview". Prefix Magazine. Retrieved 15 April 2009. ^ Nelson, Jenny (18 February 2009). "Empire Of The Sun Interview". Clash. ^ "The Sleepy Jackson's Luke Steele Returns With New Band". NME. 24 September 2008. Retrieved 12 July 2009. ^ "ARIA Charts – Accreditations – 2010". Australian Recording Industry Association. Archived from the original on 25 January 2012. Retrieved 20 May 2010. ^ a b c d "Certified Awards Search". British Phonographic Industry. 17 July 2009. Archived from the original on 17 January 2010. Retrieved 20 May 2010. ^ a b c "Empire Of The Sun". Official Charts Company. Retrieved 28 April 2013. ^ Sendra, Tim. "Ice on the Dune - Empire of the Sun review". allmusic.com. All Media Network, llc. Retrieved 17 August 2015. ^ a b Bella, Sarah (11 April 2013). "Empire Of The Sun To Release New Single 'Alive' Next Tuesday". mostix.com.au. Moshtix Pty Ltd.
^ Brandle, Lars (28 November 2009). On The Rise, Australian Sales Edge Out Of The Red. Billboard Magazine. Nielsen Business Media, Inc.
^ a b Robert Copsey (20 June 2013). "Empire of the Sun interview: 'We want Vegas show with elephants'". Digital Spy. Hearst Magazines UK. Retrieved 17 August 2013. ^ a b Lee, Chris. "Coachella 2014: Empire of the Sun brings pomp and circumstance to the rave tent". Los Angeles Times. ISSN 0458-3035. Retrieved 17 August 2015. ^ a b "ARIA Noms + Fine Arts & Artisan Winners". Australian Recording Industry Association (ARIA). 14 October 2012. Archived from the original on 19 December 2013. Retrieved 20 October 2013. ^ a b "APRA History". Australasian Performing Right Association (APRA). Archived from the original on 20 September 2010. Retrieved 28 May 2010. ^ a b Collins, Simon (26 September 2009). "Man of Steele". The West Australian. West Australian Newspapers Ltd.
^ a b c McGee, Linda (8 April 2009). "Empire of the Sun interview". RTÉ. Retrieved 27 November 2009. ^ "Sleepy Jackson, The - Lovers at Discogs". Discogs. Retrieved 24 December 2011. ^ "Teenager Bound and Gagged Press Release Copy at Discogs". Retrieved 24 December 2011. ^ a b Treuen, Jason (4 February 2008). "Rolling Stone: Pnau interview". jasontreuen.wordpress.com. Rolling Stone. Retrieved 26 August 2010. ^ "Pnau - Hyperactive". www.music-house.co.uk. Hyperactive. Retrieved 14 June 2015. ^ "Pnau.net Track by Track Analysis at Web Archive.org" (PDF). Web Archive.org. Archived from the original (PDF) on 5 February 2009. Retrieved 25 December 2011. ^ "Elton John Loves PNAU". Crushable. Retrieved 26 August 2010. ^ "Planet Notion » Interview: Peter Mayes of Pnau". planetnotion.com. The Random Agency. 13 August 2013. Retrieved 17 August 2015. ^ Hardaker, Tim (14 August 2008). "Nick Littlemore & Luke Steele team up". fasterlouder.com.au. Fasterlouder Pty. ^ "Empire Of The Sun - Walking On A Dream". Discogs. Retrieved 18 August 2015. All except noted: "Discography Empire Of The Sun". australian-charts.com. Hung Medien. Archived from the original on 30 August 2013. Retrieved 28 April 2013. "High and Low": "CHART WATCH #386". auspOp. 17 September 2016. Retrieved 17 September 2016. ^ "Empire Of The Sun – Walking On A Dream". australian-charts.com. Hung Medien. Retrieved 28 April 2013. ^ a b Hubbard, Michael (28 June 2013). "Interview: Empire Of The Sun". musicOMH. OMH. Retrieved 18 August 2015. ^ Valenzuela, Jonathon (4 October 2009). "Parklife 2009: Empire Of The Sun, Metric, Lady Sovereign". Time Out. Time Out Group Ltd. Archived from the original on 5 January 2016. ^ "Empire Of The Sun - Standing On The Shore". Discogs. Retrieved 18 August 2015. ^ Murray, Robin (8 June 2009). "Luke Steele To Take Break". Clash. Retrieved 10 September 2016. ^ "Empire Of The Sun - Without You (New Version)". Discogs. Retrieved 18 August 2015. ^ Michaels, Sean (1 October 2009). "Empire of the Sun's 'missing' member resurfaces". the Guardian. Retrieved 18 August 2015. ^ a b McNamara, Tim (26 November 2010). "Littlemore discusses Empire sequel and Pnau's "emotional" new album". The Music Network. Archived from the original on 29 November 2010. ^ "One sleep until Full Noise fest". themorningbulletin.com.au. 23 October 2009. Retrieved 18 August 2015. ^ McMaster, Matt (26 November 2009). "Foreshore Summer Music Festival all set for Saturday!". fasterlouder.com.au. Retrieved 18 August 2015. ^ Noakes, Maria (1 March 2010). "Future Music Festival 2010 Perth show review". theaustralian.com.au. News Limited. ^ Hernandez, Daniel (April 2010). "Intersections: On my first Vive Latino *". danielhernandez.typepad.com. Retrieved 20 August 2015. ^ Holliday, Josh. "Empire of the Sun interview - Virgin.com". Virgin.com. Archived from the original on 22 September 2015. Retrieved 8 September 2015. ^ Struyf, Herbert (4 July 2010). "Review: Empire Of The Sun op Rock Werchter 2010 (Pyramid Marquee) ★★½". humo.be (in Dutch). Retrieved 8 September 2015. ^ Young, Alex (28 April 2010). "Empire of the Sun announces debut North American shows". consequenceofsound.net. Retrieved 8 September 2015. ^ a b c "Discographie Empire Of The Sun" (in German). charts.de. GfK Entertainment. Retrieved 28 April 2013. ^ "Empire of the Sync reign in Germany - Artists - The Music Network". themusicnetwork.com. Peer Group Media. 11 November 2010. Archived from the original on 14 November 2010. ^ Craddock, David (16 July 2011). "Empire of the Sun get busy on second album". Perth Now. Retrieved 31 March 2012. ^ Adams, Cameron (28 July 2011). "Album review: Soft Universe by Pnau". heraldsun.com.au. NewsCorp. ^ "Sir Elton John and Pnau top album chart". BBC News. BBC. 23 July 2012. Retrieved 18 August 2015. ^ Minsker, Evan (11 March 2013). "Empire of the Sun Announce New LP, Share Epic Album Trailer". Pitchfork. ^ Locker, Melissa. "11 Best Music Videos of 2013 (So Far)". Time. ISSN 0040-781X. Retrieved 12 September 2015. ^ a b Steffen Hung (13 August 2009). "Italian charts portal". Italiancharts.com. Retrieved 4 April 2016. ^ Farrelly Brothers (18 April 2013). "Empire of the Sun will be doing the music for Dumb and Dumber To. Check out the first single of their new album". Farrelly Brothers on Twitter. Twitter. Retrieved 16 August 2013. ^ "iTunes - Music - Ice on the Dune by Empire of the Sun". iTunes. 15 April 2013. Retrieved 15 April 2013. ^ "iTunes - Music - Ice on the Dune by Empire of the Sun". iTunes. 19 May 2013. Retrieved 19 May 2013. ^ a b c Kaplan, Ilana (9 November 2015). "24 Hours in LA with Empire of the Sun: Vodka, Robots, and Lots of Lasers". Noisey. Retrieved 10 September 2016. ^ Tom Mann (15 August 2013). "Luke Steele vs Daft Punk: "We've got better songs"". Faster Louder. Faster Louder Pty Ltd. Retrieved 16 August 2013. ^ "FIFA 14 SOUNDTRACK REVEAL". EA Sports. 17 September 2013. Retrieved 22 November 2016. ^ "Empire of the Sun Say New Album Is 'On God's Timetable'". Retrieved 9 September 2015. ^ Kapur, Alisha (21 September 2015). "Concert Review: Empire of the Sun lights up Hollywood Bowl with psychedelic show". dailybruin.com. Retrieved 10 September 2016. ^ "Empire Of The Sun Perform To Sell-Out Crowd At Hollywood Bowl". theMusic. Retrieved 10 September 2016. ^ "2016 Honda Civic TV Spot, 'The Dreamer' Song by Empire of the Sun". iSpot.tv. Retrieved 24 January 2016. ^ a b Pearce, Sheldon (22 August 2016). "Empire of the Sun Announce New Album Two Vines". Pitchfork. ^ Reed, Ryan (22 August 2016). "Empire of the Sun Recruit Lindsey Buckingham for New LP". Retrieved 23 August 2016. ^ Phares, Heather. "Empire of the Sun | Biography". AllMusic. Rovi Corporation. Retrieved 18 July 2016. ^ "Going Far Out With Empire of the Sun | SPIN". Retrieved 9 September 2015. ^ White, Caitlin (4 June 2013). 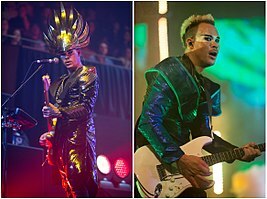 "Interview: Empire of the Sun's Luke Steele on "Ice on the Dune," Working With Jay-Z, and His Thoughts on Daft Punk". Pigeons and Planes. Retrieved 23 August 2013. ^ Youngs, Ian (5 December 2008). "BBC Sound of 2008: Empire of the Sun". BBC News website. Retrieved 1 January 2009. ^ "Kings of Leon top Triple J's Hottest 100". 25 January 2009. Archived from the original on 31 January 2009. ^ "Discographie Empire Of The Sun" (in German). austriancharts.at. Hung Medien. Retrieved 28 April 2013. ^ a b "Discografie Empire Of The Sun" (in Dutch). Ultratop. Hung Medien. Retrieved 28 April 2013. ^ a b "Discographie Empire Of The Sun" (in French). lescharts.com. Hung Medien. Retrieved 28 April 2013. ^ a b "Discography Empire Of The Sun". irish-charts.com. Hung Medien. Retrieved 28 April 2013. ^ a b "Discografie Empire Of The Sun" (in Dutch). dutchcharts.nl. Hung Medien. Retrieved 28 April 2013. ^ a b c "Discography Empire Of The Sun". charts.org.nz. Hung Medien. Retrieved 28 April 2013. ^ a b "Empire Of The Sun". swisscharts.com. Hung Medien. Retrieved 28 April 2013. ^ a b "Empire Of The Sun". Billboard. Retrieved 8 September 2014. ^ "ARIA Charts – Accreditations – 2010 Albums". Australian Recording Industry Association. Archived from the original on 25 January 2012. Retrieved 20 May 2010. ^ a b "Gold-/Platin-Datenbank (Empire of the Sun)" (in German). Bundesverband Musikindustrie. ^ "2009 Certification Awards – Gold". The Irish Charts. Irish Recorded Music Association. Retrieved 31 March 2012. ^ Pearce, Sheldon (22 August 2016). "Empire of the Sun Announce New Album Two Vines". Pitchfork. Retrieved 23 August 2016. ^ "NZ Heatseekers Albums Chart". Recorded Music NZ. 7 November 2016. Retrieved 4 November 2016. ^ "ARIA Charts – Accreditations – 2010 Singles". Australian Recording Industry Association. Archived from the original on 25 January 2012. Retrieved 9 May 2010. ^ a b "Italian single certifications – Empire of the Sun" (in Italian). Federazione Industria Musicale Italiana. Retrieved 29 November 2013. Select "Tutti gli anni" in the "Anno" drop-down menu. Select "Empire of the Sun" in the "Filtra" field. Select "Singoli online" under "Sezione". ^ a b "Gold & Platinum". RIAA. Retrieved 4 April 2016. ^ "Gold & Platin" (in German). IFPI Austria. 22 February 2011. Archived from the original on 11 May 2011. Retrieved 28 April 2013. ^ "Awards 2011". swisscharts.com. Hung Medien. Archived from the original on 8 August 2011. Retrieved 31 March 2012. ^ "ARIA Charts – Accreditations – 2013 Singles". Australian Recording Industry Association. Archived from the original on 8 May 2013. Retrieved 26 August 2010. ^ "Chrysalis – Single by Empire of the Sun on iTunes". iTunes Store. Retrieved 1 February 2019. ^ "NZ Heatseekers Singles Chart". Recorded Music NZ. 5 September 2016. Retrieved 2 September 2016. ^ "Breakdown" exclusive bonus album track[permanent dead link] iTunes Store. Retrieved 13 September 2009. ^ "Watch Empire of the Sun Become Aliens In 'DNA' Video". radio.com. CBS Radio Inc. 5 September 2013. Retrieved 8 September 2013. ^ "WALKING ON A DREAM WITH 11 ARIA NOMINATIONS!". Empire of the Sun. 8 October 2009. Archived from the original on 5 October 2011. Retrieved 4 January 2018. ^ "Nominations for Song of the Year - 2010". Australasian Performing Right Association (APRA). Retrieved 27 May 2010. ^ a b "2010 Winners - APRA Music Awards". Australasian Performing Right Association (APRA). Archived from the original on 1 July 2010. Retrieved 24 June 2010. Wikimedia Commons has media related to Empire of the Sun.